Cork'd Twitter Team Page Showcases Each Member as "Who's Talking?" As you know, social media engagement is all about personal touches. Remember this when thinking through your social media presence, including Twitter. As much as possible, introduce and humanize your Twitter team. Here are a couple of great examples of brands who have added special touches to their Twitter strategies, going beyond a standard Twitter presence to introduce and promote their Twitter teams. 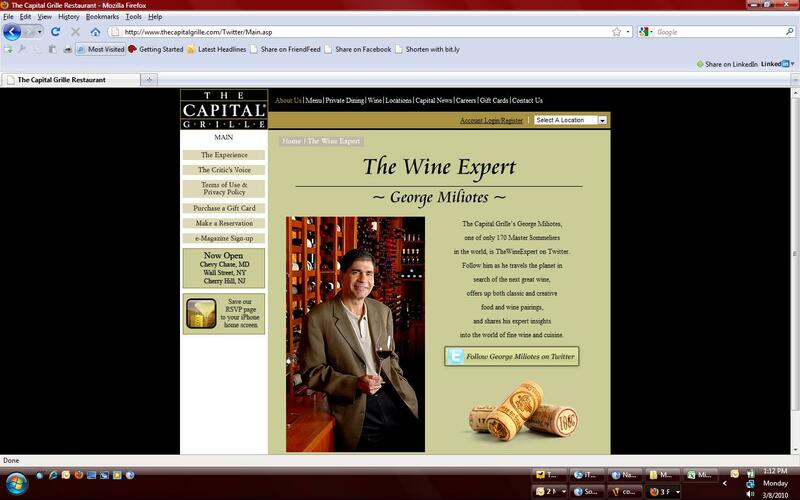 A simple, dedicated Twitter page for The Capital Grille’s Master Sommelier, George Miliotes invites web visitors to engage with George on Twitter. The Capital Grille’s main navigation bar also includes a button linking to George’s twitter profile. 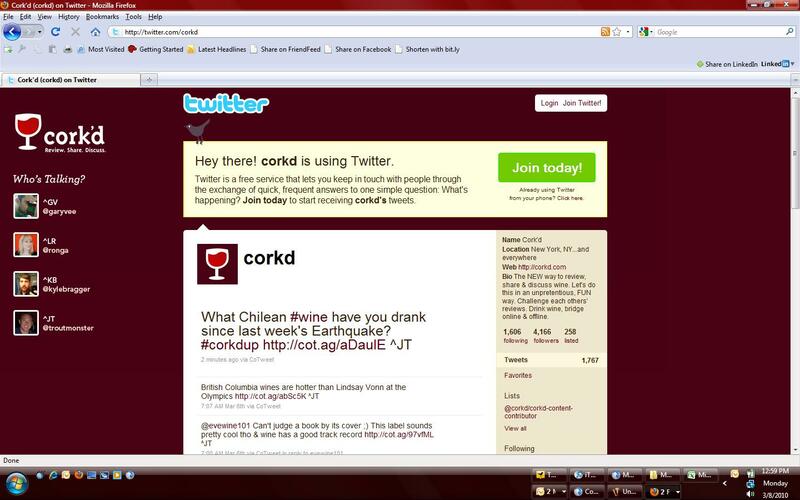 The team at Cork’d, an unpretentious wine consumer review site, designed a Twitter background that shows “Who’s Talking” from their company’s Twitter profile @Corkd (see above). Each Cork’d team member signs their initials at the end of their tweets to let followers know which of the four of them tweeted. I liked this so much that I recommended it to my clients at Vin65 and we implemented it onto our new @vin65team Twitter page. It excites me to see brands embracing the opportunity to engage with their customers and clients on Twitter by adding these types of personal touches to their marketing strategies. Have you seen any others that you like or have you implemented some into your branding? Earlier this summer, I wrote about the development of the Academy of Wine Communications Finger Lakes Chapter. With the announcement of the AWC’s new website today, it’s time for an update. The AWC has recognized that there’s a need for an organization that will become the go-to resource for wine writers, bloggers as they seek sources within the industry to interview for articles and posts. Having this information readily available on the AWC site will be a time saver for both writers/bloggers and PR and marketing representatives and becomes a first step in getting them connected. The rapidly changing wine communications industry has made it difficult to keep up with the latest in best practices for engaging with wine writers and bloggers. The Academy of Wine Communications plans to open and facilitate conversations surrounding these topics in order to keep members up to speed and ready to apply traditional methods and the latest in social technologies to help them tell their winery’s stories, establish trusted relationships with writers/bloggers and plant the seeds for coverage in a manner in which writers and bloggers want to be engaged with. I’ve been honored with the role of Finger Lakes Chapter Director of the AWC. My goal is to organize and facilitate a strong chapter here in order to help keep the Finger Lakes wine region in-the-know, front and center in the world of wine public relations and marketing. With the increase in interest in the region and the people behind the numerous wineries here, it’s prime time to continue actively collaborating and pushing forward. Let’s do all we can to make it easy for writers and bloggers to contact us and get the information, photos, videos and samples needed in a buttoned-up, efficient manner so that those writers and bloggers will come back for future articles and posts. One of the best ways to stay updated on things is to reach out to and participate in conversations with wine communicators in other regions. With that, our first meeting will be an info session to discuss the organization and get your input on the shape of our chapter. I’m working on the details but look for it to be sometime in November after Harvest, and you can count on a glass of wine or two. What are some of the things that you would like to see the Academy of Wine Communications help you with? In the meantime, check out the Resources pages on the site for info that can help you right away. And be sure to submit your contact information to be included in the Wine PR Directory. I have recently joined a group that I foresee as one of the future. The Academy of Wine Communications is a group of forward-thinking wine and food communications professionals interested in collaborating and shaping the future of the industry. The AWC is fueled by the passion of my colleagues, Michael Wangbickler of Balzac Communications and Caveman Wines blog who is the Executive Director and Lisa Adams Walter of Adams Walter Communications, Assistant Director. The AWC is built on the vision of original founders Paul Wagner, Harvey Posert and Sam Folsom. The AWC has roots in the Napa/Sonoma region but has its eyes on networking and creating chapters throughout the U.S. and beyond. The first meeting of members and prospective members took place on June 30th at the Culinary Institute of America at Greystone where this video was shot. Michael walks attendees through the history and vision of the AWC…and specifically calls out the Finger Lakes region as one that we’re looking to create a vibrant chapter in. I can think of several wine PR friends here that I would love to see get involved in our chapter’s development: the Academy of Wine Communications-Finger Lakes Chapter. As you know, wine public relations and communications is changing rapidly and it’s challenging to keep up with the latest developments and best practices. Social media is a powerful way for wineries and other wine businesses to engage and tell their stories to their prospective customers and current customers. There is a unique ability for wineries to personally respond to inquiries which is a tremendous relationship builder for them beyond tasting room interaction. By getting involved with the AWC, you can network and collaborate with other wine public relations and communications people throughout the national membership chapters and share insights on what’s working and what isn’t in new media, specifically in the wine and culinary industries. We will also work to become a resource for bloggers and journalists who are looking for industry experts and creative content ideas. Social media allows wine PR people to get to know bloggers and journalists on a more personal level and keep attuned to their preferences and needs. The AWC is using social media tools such as Twitter, Facebook, LinkedIn, slideshare and video sharing platforms like Ustream to update members and prospective members about the group’s activities. It’s with this type of forward thinking, collaboration and sharing that an up-and-coming region like ours will move forward and gain more visibility…and respect. Sometimes I have to pinch myself just to be sure I’m not dreaming. Just about a year ago, my husband and I had a serious discussion about my work-from-home business plan. I was working on projects for a great client in the B2B and Technology public relations world, making a steady stream of income and couldn’t begin to complain about it. But sitting on our back deck in the middle of the Finger Lakes with so many wineries full of enthusiastic and passionate people just up the road, I kept thinking about them. How could I get involved and possibly even help to spread the word about the people and wines that I have grown to love? Should I give up a guaranteed monthly check to explore redirecting my business so that it melds my passions for the wine industry, the charming, down-to-earth people behind the wine and public relations? Add to this the fact that my husband and I are dying to buy our first house together. Oh, yes and Honey, I want to start off by establishing my name by providing resources and a few pro bono hours to causes I believe in and I want to utilize a client attraction mindset, not a hard sell of any kind. Trust me, it will all work out and I’ll have great contacts who are more like dear friends who may become loyal clients. Well, even though you may not hear directly from Rich, he is a strong supporter of our cause and spends many hours discussing and debating the hot topics of the region and its wine industry with me. He has shown his belief in me and in the industry by fully supporting my dream to get involved and make a difference here. For this I am forever grateful and I wanted to say thank you, Rich. I couldn’t be happier to see this dream of ours as it has taken hold and I meet people face-to-face who are glad to see me and have warmed up to me as an outsider who came in and started making some noise in hopes that I could make a small difference and tell others about the wine and people of the Finger Lakes. During this tremendously challenging time for the state of New York, it has become that much more important to us to contribute to our local economy instead of just complaining about it. In the wake of that journey, I have met so many fantastic, helpful people throughout the wine world…a tremendous bonus. I now find myself with several new clients and plenty of prospects who are like-minded and all exude enthusiasm and passion that is contagious. I am truly blessed with support from Rich, my family, friends and clients. Thank you, all!! The first Wine Bloggers Conference begins tomorrow afternoon in Santa Rosa. The conference organizers actually had to close registration at just over 170 attendees! This will be my first trip out to the West Coast, so I’ll be reporting back on my impressions of the region as well as WBC attendees I’ll be meeting and my experience at the conference. This might seem funny, but I’ll be meeting Lenn Thompson at LENNDEVOURS blog for the first time in person. Do you know how we “met” in the first place? Via Open Wine Consortium. We discovered that we share a passion for telling the story of the NY wine industry and engaged in discussions solely via OWC, email and Twitter. And you probably know that this friendship has developed into an offer from Lenn for me to contribute to LENNDEVOURS as an additional voice for the Finger Lakes as the new Finger Lakes News Correspondent. It has been a great experience for me. I will also have an opportunity to meet Tom Wark, Partner at Wark Communications, a wine marketing communications firm in Sonoma and very well-known wine blogger at Fermentation. Tom and I have also struck up a friendship and have been collaborating on a project that I will reveal down the road. How did I meet Tom? Earlier this year, I decided to research my idea of starting a business that would focus on Public Relations and Marketing for the wine industry, with a special interest in promoting Finger Lakes Wine Country and other wine businesses both locally and nationally. A Google search revealed Fermentation, a daily wine blog where Tom addresses issues in wine PR, culture, and wine politics as well as his personal experiences as a wine PR guy for almost 20 years. What better way to get an insider’s view of the business that I was researching than to read about the experiences of someone who has been in the industry for awhile. Back to how I met Tom. After devouring many of his posts, I saw a topic that a newbie like me could chime in on…and posted a comment including my name. I have followed Tom on his blog since then and have left a handful of comments. In one of the posts, Tom had revealed that he had been seeking Freelance Public Relations consultants for Wark Communications, so I then submitted my credentials and an email expressing my interest in working with him. A few months later, he had a need for extra hands on a project and contacted me about it. So we’ll also finally have the opportunity to meet this weekend. Why am I telling you all of this? Because I want to share my experiences of the power of social media. I would be remiss if I didn’t tell you about the opportunities that I have had come my way because of dedicating some time to social networking. If you have been thinking about getting involved in some form of social networking, just give it a try. Do it within your own comfort level at first, and then start engaging. Give me a call if you’re unsure of how to get started or where. There are some valuable conversations going on out there that can help you promote your winery or solve a nagging business problem by finding a great new vendor…or even let you have a good laugh at the funny stuff going on outside of your winery’s doors. I’ll be back in touch soon with updates. My husband Rich and I will be flying down to Atlanta to visit my parents and spend a couple of days in Savannah. We’re hoping to get into The Lady & Sons for my dad’s birthday dinner, so I’ll let you know what my impressions of the restaurant are if we are able to secure a reservation. I’m also curious to try some Georgia wines, especially to compare them to the wines of New York. It will be interesting to see how readily available they are at retailers and grocery stores. Will be back in touch soon and enjoy your week!